The 51st legislature of Student Government Association (SGA) voted to table the Elections Code bill for the second consecutive week after another round of debate. SGA also confirmed Cameron Alexander (20C) as the secretary and clerk on the executive board, voted to establish and fund $3,230 to the Undergraduate Sexual Health Initiative (USHI) and approved $350 in funding for Emory Global Connections Night. Freshman Representative Austin Graham (21C) said that the Elections Code bill, which would prohibit candidates from running on a joint ticket, would affect his future plan of running for SGA president, and he is, therefore, not comfortable with making a decision on the bill. BBA Junior Representative Jacob Spitzer (19B) said SGA elections are “popularity contests” and that the current version of the Elections Code creates “a more diverse support” from different schools because people are running together. “It’s important that you have people running on a ticket so that you have people that can represent different parts of the school as opposed to just one person who has a lot of popularity overall,” Spitzer said. Chair of the Elections Board Betty Zhang (20C) said it would be difficult to enforce rules preventing candidates from campaigning together. Vice President of International Student Relations Dwight Ma (17Ox, 19C) said that he learned to work with Oxford Continuee Representative Muhammad Naveed (17Ox, 19C) when both were Oxford SGA president and vice president, respectively, despite running on different platforms. “[Muhammad and I] had different platforms when we were campaigning, [but] we ended up working very well, and we felt that the different perspective that we brought to SGA were very valuable and people in SGA also recognized that as well,” Ma said. Sophomore Representative Johnna Gadomski (20C) said that there’s a lack of competition during elections for SGA positions, with one or two people running for one position or only incumbent SGA legislators running. 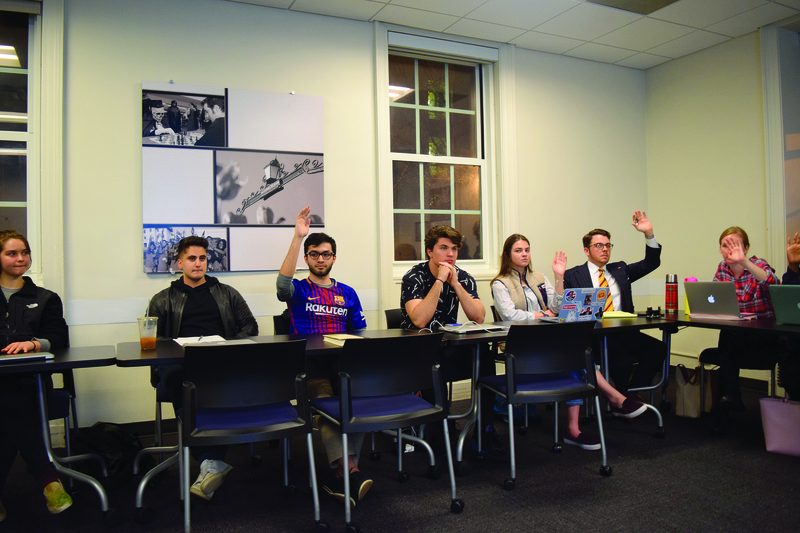 “Especially at the president and vice president level, we want to eliminate any barriers to people running because we do want to have this to be as democratic as a process as possible,” Gadomski said. When SGA Executive Vice President Natasha Armstrong (18B) asked legislators to raise their hands if they had read the section of the Elections Code that legislators were debating, Graham was the only person who raised his hand. “There’s not an actual knowledge [among the group] of how elections actually work,” Armstrong said. Speaker of the Legislature William Palmer (18C) told the Wheel he was disappointed in the legislators for tabling the bill again and said he hopes the delay will result in a more informed decision next week. “It’s definitely, as bill author … annoying for me that we’re [delaying] every week, and as speaker it’s annoying for me that we’re doing this every week because we’re not able to fully consider other bills and do normal order where we don’t talk only about this in sessions,” Palmer said. Bill 51sl44 confirms Alexander, who previously attended numerous legislative sessions as a constituent, as secretary and clerk of the board. Former SGA Secretary Sakshee Sunil Sarrawgi (19B) resigned. Armstrong spoke highly of Alexander and said he is eager to be involved in SGA. During the last few minutes of the meeting, the legislators passed Bill 51sl42 to establish and fund USHI, with 12 votes in favor. In less than two minutes, the legislators passed Bill 51sl44 to fund the Emory Global Connections Night with nine votes. The bills provide $3,230 toward USHI and $350 in funding to the Emory Global Connections Night. Three legislators left the meeting early due to a commitment to the BBA Council and did not vote on the last bill.